NEW CANAAN, CT. – Jan. 18, 2000 – Irving Levin Associates Inc., a research and information firm that tracks investments in the health care market, announced today the launch of a new publication, The e-Health Investor. This newsletter focuses on investment trends in the emerging Internet health care marketplace. The bi-weekly newsletter includes information on stock returns, IPOs, private equity financing, and merger and acquisition volume, among other information regarding Internet health companies. The e-Health Investor joins Levin’s other newsletters, including The SeniorCare Investor, The Health Care M&A Monthly and other annual publications. “The Internet has found health care, a market which encompasses 15 percent of the gross domestic product, and the combination is explosive,” says Stephen M. Monroe, senior editor of The e-Health Investor and managing partner at Irving Levin Associates Inc. This month’s debut of The e-Health Investor is very timely. More than 21 initial public offerings occurred last year, with five taking place in December 1999 alone. MotherNature.com was among the December IPOs. In addition to covering IPO activity, The e-Health Investor will discuss e-commerce and connectivity companies dealing with health care. The focus will be on the merger and acquisition market, secondary market performance, venture capital financing, joint ventures and alliances and strategic investments. The publication will provide timely information on the deals and financing, as well as analysis and opinions about what is going on and what will happen in this fast-moving market. The e-Health Investor charter subscription price is $285 per year. For more information, or to order, call 800-248-1668. 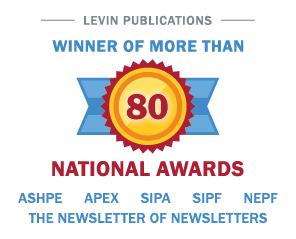 Irving Levin Associates Inc. was established in 1948 and has headquarters in New Canaan, CT. This privately held corporation publishes research reports and newsletters, and maintains merger and acquisition databases, on the health care and senior housing market. The firm has a strategic alliance agreement with Cushman and Wakefield, a national commercial real estate company, for the valuation of senior housing and health care properties.